Las Cruces, New Mexico, proved to be more than just a bump in the road for the Hawai’i basketball team. It was more like a spike strip that blew out all the tires, as the Warriors suffered their worst loss of the season, 115-73, at New Mexico State. A crowd of 5,223 at the Pan American Center in Las Cruces, N.M., watched the Aggies dominate the game from start to finish. 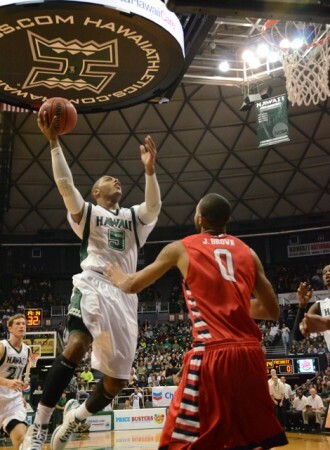 Hawai’i dropped to 15-12 overall, and remained in fourth place in the Western Athletic Conference at 6-5. New Mexico State improved to 21-8 overall and is in second place in the WAC at 8-3. The 115 points was the most scored against a Hawai’i team since 1998, when TCU scored 126. The 42-point margin of loss was the second largest in Hawai’i’s WAC history (Utah State beat Hawai’i by 44 in 2010). Daniel Mullings, a 6-foot-2 freshman, led the Aggies with a triple-double of 28 points, 12 rebounds and 10 assists. He shot 11 of 15 from the field, and also had five steals. He entered the game averaging 8.3 points and 3.4 rebounds per game. It was the second consecutive game that an opposing player recorded a triple-double against the Warriors. New Mexico State hit eight of its first nine shots and opened the game with a 16-7 lead, and then basically ran away from the Warriors after that. The Aggies finished the game with a .603 field goal percentage – the highest by a Hawai’i opponent this season. After not allowing an opponent to shoot better than 50 percent from the field for the first 24 games of this season, the last two (Montana and New Mexico State) have topped the 50 percent mark. Joston Thomas led the Warriors with 13 points, although he fouled out with nearly 12 minutes remaining in the game. Trevor Wiseman added 12 points, and Shaquille Stokes contributed 10 points off the bench. Hawai’i’s top players struggled. Center Vander Joaquim finished with seven points and six rebounds, and played just 21 minutes due to foul trouble. Senior guard Zane Johnson scored eight points. The Warriors were whistled for 28 fouls, including three technicals. 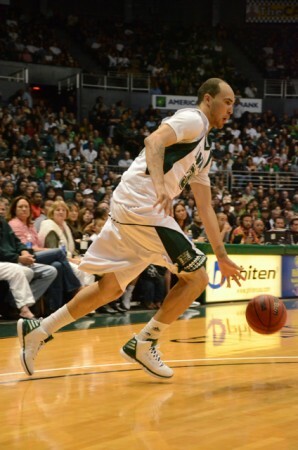 Four Hawai’i players fouled out – Thomas, Joaquim, Davis Rozitis and Hauns Brereton. Hawai’i got as close as 20-18 with 11:19 remaining in the first half, but the Aggies then went on a 14-2 run over the next four minutes to increase the lead to 34-20. The Aggies then closed the first half with a 12-2 surge to take an insurmountable 52-31 lead at halftime. The Warriors opened the second half by scoring the first seven points to cut the deficit to 52-38, but that was as close as it would get. The Warriors shot a respectable 43.1 percent from the field, but had no answers on the defensive end for New Mexico State’s attacking offense. Six Aggies finished with double-figure points. The last five minutes of the contest looked more like a pick-up game, as Hawai’i had its reserves in and Mullings played until the closing seconds so he could get his 10th assist to complete the triple-double. Wendell McKines, the WAC’s leading scorer and rebounder, finished with 20 points and eight rebounds. The Warriors will stay on the road for another WAC game at Louisiana Tech on Saturday. They are scheduled to depart El Paso, Texas, on Friday morning, and arrive in Ruston, Louisiana, later that afternoon. Didn’t watch this game but get the sense that this team is tired.. I think all that travel plus lack of any real depth plus no true leader has caught up to the Bows.. Hopefully UH can win at least 2 more and get ‘rewarded’ with the Riley Wallace post-season tournament.. Of course I’m holding out hope that UH runs the table and wins the WAC Tournament, but let’s face it, these blowout losses don’t inspire much hope especially when they come toward the end of the season..
NMSU’s first Triple Double performance by a freshman ?! Team hasn’t been the same since the wiseman incident. Zane’s shot has disapperared as well. Hope they fix whatever is wrrong. At this point they just need to get hot at the wac tournament. This team peaked too early. I don’t know where that team went, but tonight was woeful. They are getting progressively worse. I feel like when they were playing their best and the offense started clicking…we suddenly became an offensive team vs. a defensive team and now, our defense is non-existent. I dunno. I’m a really depressed fan right now. On a side note…it kind of pissed me off that the New Mexico State coach left his starters in for so long. Wow! It was painful to watch. It looks like opponents are letting Hawaii take the outside shots and they crash the boards with muscle and athleticism. I hope Hawaii can get 2 more w’s and get invited to a tournament. You guys can do it, man. Don’t let the ship sink. OMG,Yikes, one of the worst losses in Warrior History, tying a loss back in 98 to TCU in Riley’s days. They have to get back into it NOW, wake up Warriors and beat up La Tech . We need this win so badly!!!!!!!!!!!!! by the way…the article headline seems a bit understated. Embarrassing loss. The team lacked heart in this game. Zane has gone MIA, and no senior leadership. Our guard play right now is a F. No athleticism, and/or no outside shot. Our last two opponents killed us in the backcourt, with two consecutive triple-doubles. For next season,time to think about letting some players move on as it is painfully obvious that Miles, Stokes, etc. are not progressing as players. If Nevada’s Burton, LT’s Appleby, and NMSU’s Mullings can all succeed as Freshman than it’s pretty obvious that Miles and Stokes aren’t going to cut it. Keep one if we must but we need new blood at the point as well as an athletic wing who can shoot. Whew! This road trip , Hawaii would have rough time…Montana 20 game winner, NMSU 20 game winner, I figured if they can get 1 WAC road win….i.e. LaTech, it would be success. Maybe team members have flu…NMSU loaded with talent..thought they would win by 20 or so, not by 40, but hey, AC and Alika gave up over 120 points to TCU when, that Riley coached team was really good. I am sure, unless guys give up…they will give LaTech good game.., gotta win that one. Been supporting UH MBB for near 50 years , so always support guys..!! Gib looked flustered too, hope they get it together! Guys(UH men BB team) don’t ever give up!! I agree, that headline is way too kind. Watching the replay now. They do seem listless and there is a lack of leadership since Zane lost his stroke. This is probably the biggest test they will face all season, whether they can fix whatever element is broken and fight back after being stomped so embarrassingly. I’ve got a lot of faith in them though and I know the talent is there. Keep fighting you Warriors!